Corona Chorus features Speed, Depth, Color and Level controls, true bypass design, a small footprint, analog-dry-through, easy-access battery hatch and is built from the highest-quality components. We set out to design a great sounding chorus, and we have made sure that the legendary TC Electronic quality shines though in all the available sounds, from our own SCF Chorus to the more TriChorus L.A. session studio swirls and all the way through to more contemporary chorus sounds. The SCF Chorus is TC Electronics legendary chorus pedal, which came to market over 25 years ago and is still and industry standard to this very day, due to its incredible dynamic range and lack of noise. 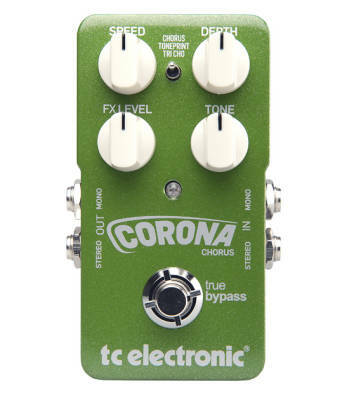 Corona Chorus offers great chorus tones right out of the box, but the knobs are specifically designed to allow you to tweak to your hearts desire. The Speed knob lets you dial in anything from slow 80s chorusing to fast leslie-like sounds, while the Depth knob sets how intense the sound is going to be. The Tone knob allows you dial in the chorus exactly how you like it- from dark and vintage to pristine TC shimmer to a sound that really punches through the mix. And finally, the FX Level determines how much of the effected signal is added to your dry sound. But there is more to Corona Chorus than meets the eye. We call it TonePrint, and it will rock your world. Via a simple USB-connection, TonePrint allows you to download custom tunings made by your favorite guitarists straight into your pedal, easy, free and fast. A vast and ever-expanding roster of the finest guitarists alive are working with us to give you their custom TonePrint settings, so forget emulation, lets talk collaboration! TonePrint - instant access to custom pedal-tweaks made by your idols! I'm using this for fretted and fretless basses, it is the best chorus I have heard or used there are three settings, one is a "single" chorus, another a more complex sounding "tri-chorus". Both are so superb that I haven't even looked at downloading any of the tone prints for the third setting. Stereo in as well as out allows you to maintain a true stereo line and the pedal is switchable between true bypass and buffer. This is especially useful with "time" effects as in buffer mode, chorus, delay and reverb are all allowed to fade naturally instead of cutting off when you switch of the effect, making a smooth transition rather than a clunking halt. With TC's toneprint technology, you can get any chorus sound you could want out of this thing. The emulation of other sounds is really good. I can't see myself ever needing another chorus pedal.